A 19-year-old MS-13 gang member was sentenced to 10 years in prison for a stabbing a year ago in Leesburg. 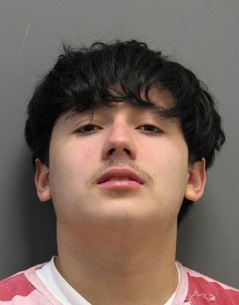 Jose Israel Alvarenga appeared before Loudoun County Circuit Court Judge Jeanette A. Irby Thursday afternoon on one count of malicious wounding, one count of gang participation and one count of felony obstruction of justice. He pled guilty to all three in August. The case stems from a Nov. 7, 2015, assault in Leesburg. Prosecutors said Alvarenga approached a Leesburg man he believed to be a member of the 18th Street gang. The victim denied any involvement in the 18th Street gang and Alvarenga demanded that he join the MS-13 gang. When the victim told Alvarenga that he did not want to join a gang and walked away, he was kicked in the back. Alvarenga threatened to kill the victim if he did not join MS-13. The victim fled from the area. Few days later, the victim was attacked in a parking lot by two MS-13 gang members who beat him and stabbed him with a machete-style bladed weapon. He suffered multiple stab wounds to his head, neck and hands, losing a finger in the attack and suffering permanent scarring to his face, ear, head, neck and hands. The attackers were identified as Josue Jeremias Cruz Gonzalez and Jose Roel Guevara Machado. Alvarenga was arrested on Nov. 16, 2015, on warrants related the assault. Prosecutors said that while in jail, Alvarenga offered to pay other inmates to kill the victim prior to his trial; he requested a photo of the victim’s head cut off as proof. Alvarenga told inmates that he had instructed Cruz Gonzalez and Machado to kill the victim. Cruz Gonzalez, 20, pleaded guilty to malicious wounding and gang participation. He was also sentenced to 10 years. Guevara Machado, 21, pleaded guilty to malicious wounding and gang participation on July 25. He is scheduled to be sentenced in Loudoun County Circuit Court on Jan. 5 and faces up to 30 years in prison.